It’s nice to be reminded every once in a while the things that make America great. Things that are uniquely specific to the good old US of A. Like cheeseburgers, cheap beer, Dolly Parton, John Wayne and pulled pork. There are things that one will only find in America and sometimes leave those not living in the borders from sea to shining sea scratching their foreign heads. The American muscle car is just such a thing. Sure, there are fast sports cars made outside the US, but the European versions, like the Euros themselves, tend to be somewhat refined, colored inside the lines, a bit highbrow. Not so the American versions; American muscle cars are loud, edgy, in your face with a grilled cheese sandwich on white bread and a milkshake on the side. For a time it wasn’t so however. Those of us who have been on the planet a while, half a century or so, fondly remember when American muscle cars prowled the roads proudly. Loud steel monsters that left a trail of smoke behind shook windows and left the little European cars crying on the side of the highway. The glory days of the muscle car ended too soon and the period that comprised much of the 1970s, the 1980s and 1990s became a gearhead’s version of the Dark Ages. Then came the revival. Like another uniquely American thing that once toured the country sitting up tents and led by sweaty men in cheap suits preaching the word, this revival came about in 2005. The preaching came from Ford which reintroduced the Mustang. A retro styled machine that harkened back to the glory days and signaled that the Dark Ages were over; the Age of Enlightenment had arrived. Dodge followed in 2008 with its retro Challenger. Finally, a year later and after being out of production for seven years, Chevy brought back the Camaro. Today those three cars are the Holy Trinity of the new era of the muscle car. Each has its own following and the merits of each can be argued, but the point is for those of us who lived through the Dark Ages have a choice, a choice of a fast car that is within the reach of most middle class drivers and can be used every day. Until recently, we had driven only the Mustang and the Challenger and liked them both. The pilgrimage to complete the Holy Trinity ended when we spent a week with the 2015 Camaro 2SS. The 2015 is the fifth generation (the sixth was introduced in May and will be available in 2016) and like the others in the Trinity features a retro look that is polarizing to many. Chevy gave the Camaro some styling tweaks for 2015, but left the line pretty much alone. The Camaro has a broad range from the LS, LT, the affordable base models with a V-6 underneath to the SS with a V-8 up to the ready for the track Z/Z28 and top of the line ZL1 V-8. From a basic coupe, a convertible to a roaring beast the Camaro can be had with a variety of options and powerplants to suit just about anyone. The Camaro LS starts at $24,500 and is only offered as a coupe. You’ll get the 323-hp V6, with standard equipment that includes 18-inch steel wheels, automatic headlights, OnStar, Bluetooth, and air conditioning. The LT starts at $26,800 for a coupe, $32,000 for a convertible and nets a few more luxury features. While the LT still includes the V6, it adds 18-in alloy wheels, GM’s MyLink infotainment system and dual power front seats. An upgraded Camaro 2LT adds 19-in alloy wheels, a rearview camera, heated leather seats and rear park assist. Next up the line is the the V8-powered SS, $34,400 for a coupe, $40,400 for a convertible. In addition to its 6.2-liter V8, the SS adds 20-in alloy wheels and a sport-tuned suspension. The Camaro 2SS combines the SS’s 6.2-liter V8 with the 2LT’s luxury equipment. The top of the Camaro line are Z/28 and ZL1 models. 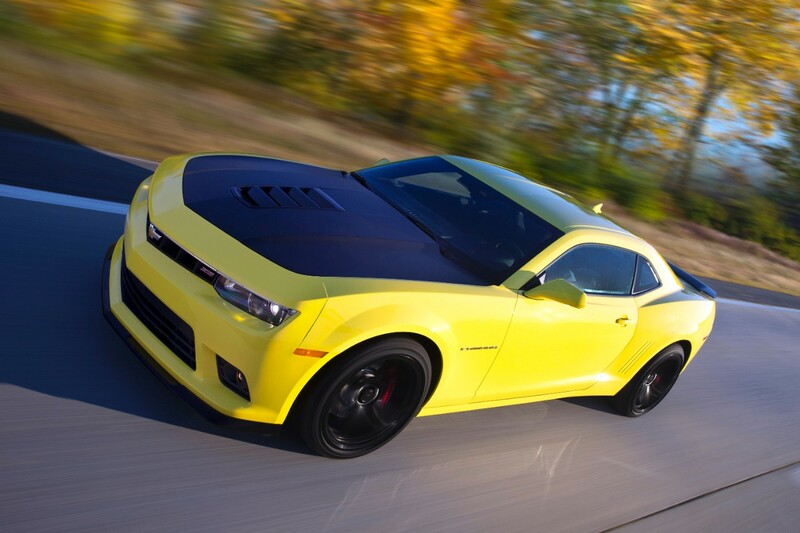 The ZL1 has an MSRP of $56,300 for a coupe or $61,500 for the convertible. The Z/28 is more of a track car and nets out near $73,300. 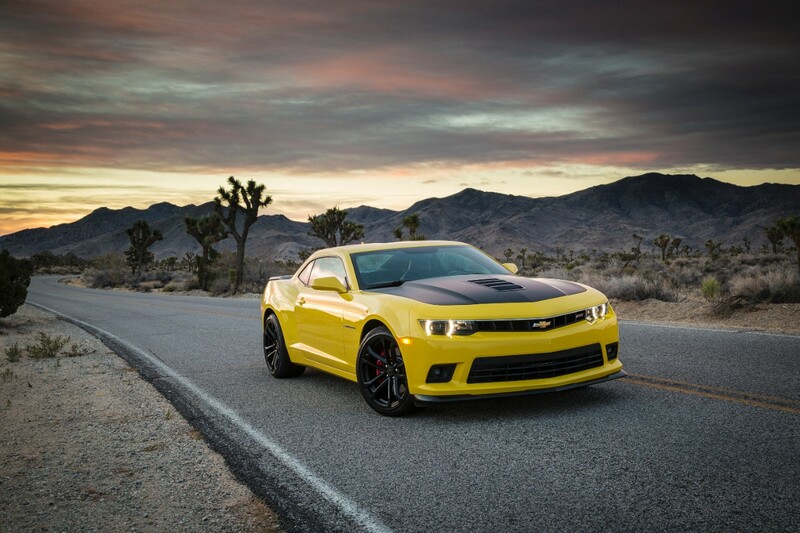 The Z/28 is coupe-only and only comes with a manual transmission, the ZL1 offers automatic or manual transmissions and coupe or convertible body styles. Both models have a long list of performance upgrades, including magnetic suspension, enhanced brakes, unique wheels and recalibrated steering. Our model for the week was the 2SS coupe; the “2” separating the 1SS by adding more standard comfort and convenience features. Among the upgrades we had were the RS package which includes 20-in wheels and xenon headlights. We also had Recaro front bucket seats with eight way power adjustments and heat. Our model also had Brembo four-wheel disc brakes, 9 Boston Acoustics speakers, A heads up display and rearview camera. Under the hood we had the 6.2-liter V8 delivering 426 horses and 420-lbs. ft torque. Although an automatic transmission is available, we had the six-speed manual. Like the others in the Trinity, the look of the Camaro is a love it or hate it design to many. We like it, because like the others it gives the impression that the Camaro is all business; it isn’t for carrying the kids to soccer practice (although it could and to be honest only kids will fit in the backseats comfortably), or taking long road trips while effortlessly gliding across the pavement. The Camaro SS is designed to do one thing, go fast. And it does that every well. The all-business theme carries over to the interior. Some have complained about the cramped quarters and our five foot eight inch frame didn’t exactly slip in with ease, but in our opinion this is a characteristic of any good sports car; if you want room get an SUV, if you want to have fun, you’ve come to the right place. The V-8 sounds like Heaven to a fan of the Trinity. 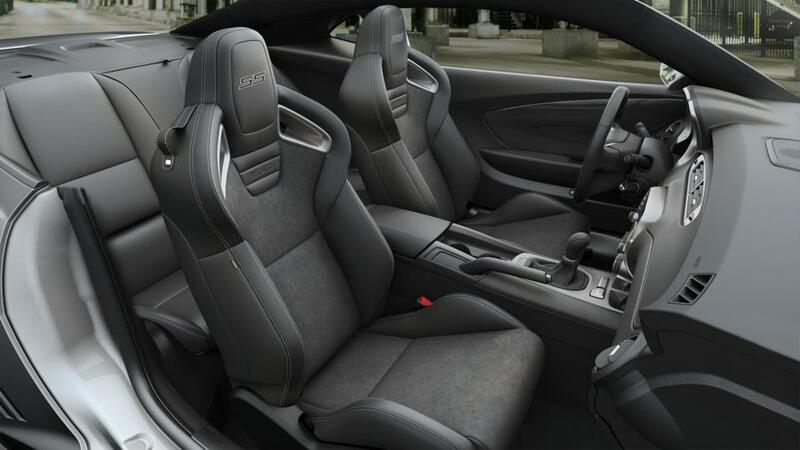 The engine note delivers a satisfying low rumble that can be felt through the leather trimmed suede seats. The power delivered to the road through the manual transmission is an adrenaline rush and when we did 0-60 in just over 4.5 seconds we were left with a smile on our face. Compared to the others in the Trinity the view is more limited but once you get used to it, isn’t all that bad. On the road, the Camaro SS is a rocketship that puts you back in your seat with very little motivation and will leave most traffic at a stop light wondering just what the hell happened. Aggressive cornering with the upgraded suspension is a joy to behold. 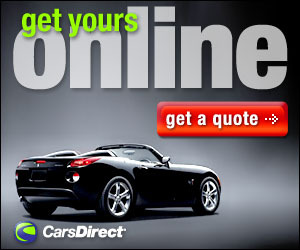 Like all of the cars we review, when they are good, or great, we hate to see them go. Such was the case with the Camaro SS. We had an absolute blast during our week and can now say we have completed the Holy Trinity of the new era of the muscle car. All three are great cars and all have their good points. For the Camaro however, in our opinion, there is something more. Having owned one of the previous generations as a youth, this new Camaro brought back many great memories. For those still in their youth, this newest generation can make some great new memories. Can someone give me an Amen? Interior cargo volume 11.3 cu.ft. Maximum interior cargo volume 11.3 cu.ft.